Amazon Web Services is one of the top-notch cloud platforms to avail cloud web hosting on cutting-edge infrastructure backed by the latest hardware, high-speed network connectivity, and resource redundancy. But, on the other, it’s a bit complicated to configure which urge many users to look for other best AWS alternative hosts offering ease-of-use, intuitive control panel, and affordability with a simplified billing system. Besides the complicated setting procedure, there is also a steep curve of learning to maintain your cloud servers on AWS structure. So before making a decision to choose them, you should have some know-how to avoid frustration or data migration in the near future. Furthermore, they don’t provide free email and instant technical support in the very basic plan. Unfortunately, you’ll have to pay a hefty amount per month to get technical support from experts which makes them more expensive than other AWS competitors. You’ll be aware of the fact that cloud hosting consists of multiple servers connected to each other and sync stored data simultaneously to all servers located across the world. This characteristic makes cloud hosting the most stable platform for businesses, big data, apps, and personal blogs. If we talk about Vultr as an AWS alternative, Vultr has widespread data centers which are hosting over 150k instances. With their 15 data centers, you never have to worry about outages or scalability. Furthermore, they provide you a high usability experience contrasted to AWS, because of their simplified hosting packages and control panel. The easy scalability is another part that makes Vultr an excellent choice either you want to host a simple blog or a large business site as well as applications resource data. Its simplicity benefits you by setting up a smaller plan and scales up the resources later – increasing resources is generally as simple as moving a slider. Where AWS is criticized due to their complex billing, Vultr has a clear edge because of their pre-designed cloud packages. Vultr provides you with a defined set of resources such as CPU cores, RAM, storage, and bandwidth, etc. Furthermore, you can either choose monthly or hourly billing. Similar to AWS, Vultr has no shortage of hosting solutions for bigger websites and resource intensive applications. They recently introduced Bare Metal solutions with full root access. These Bare Metal dedicated servers are fully allocated to you, and there is no element of resource sharing. The intuitive control panel not only allows you to do the things with one click but also empower you to deploy and manage operating system. In case if you don’t know, Amazon Web Services charge an additional fee for providing the technical support. All you get for free is their documentation and support forums. They offer 3 different packages – starts at $29/mo. While Vultr does not provide live chat support too but there is 24/7 availability of email support for which AWS charge you an additional fee. All we experience is that Vultr is a stable cloud provider and integrated with SSD servers. And just like AWS, they also have a wide number of data centers spread around the world in major cities. With 8 years in the industry, CloudSigma is another powerful alternative to AWS. And they are in compliance with ISO 27001 for security and data privacy. CloudSgima welcome you with a seven days trial account so you can experience their quality and usability practically. CloudSigma holds a robust infrastructure where large data can travel around seamlessly because of their 10GigE networking, SSD servers, and a fully virtualized environment that assures dedicated resource and better performance. Like AWS, CloudSigma has the capability to offer you heavy duty hardware. You can avail up to 40 CPU cores, 128GB RAM and availability of both SSD and magnetic drives for storage. Unlike AWS where you have to deal with various technicalities, CloudSigma offers you a straightforward way. After signing up, you can craft your package through the provided control panel. So you can add more CPU cores, RAM, storage, and bandwidth when required for your growing projects. If you are specific more about your targeted audience, then you should choose a server near to that location so to boost the website loading speed. Because of the enormous amount of servers, AWS is preferred by many seekers. CloudSigma maintained 11 data centers in different regions such as the US, Europe, Arab and Asia, etc. That’s a nice number of data centers with a facility to locate your data near your customers. Furthermore, on CloudSgima you don’t need to convert your home currency into US dollars instead you can pay in a number of currencies such as Euro, US dollar, Swiss Francs, British Pound, Saudi Riyal, and more. Although CloudSigma provides you trustable services within extremely affordable pricing yet, there are freebies too. By spending just $10 each month, you will get 1GB RAM, 50GB SSD, and 5TB bandwidth. Technical support is another area that makes CloudSigma best alternative to AWS. Their support team is available 24/7 on emails as well as live chat. Generally speaking, you might not much hear about them, but their global presence, SSD servers and fully KVM virtualization make them a trustworthy cloud provider. With a broad range of options, DigitalOcean comes with trustable servers when searching AWS alternatives. DO is one of the leading company that scattered over 12 giant data centers. They are serving 1+M developers belongs to almost 195 countries. So it means they are pretty popular and a reliable cloud host. Just like AWS, DigitalOcean is using SSD servers which results in fast data reading as well as writing compared to the hard disk drives. The primary reason that why many customers prefer them is the simplicity of setting up an account. You can start by simply picking up a plan. The pre-made plans start from 1GB RAM, 25GB storage, and 1TB monthly data transfer. Like any cloud service, the plans are extensible, and you can resize the resources corresponding to your needs. Because of their large widespread infrastructure, DigitalOcean has the capacity to handle a project of any size. DigitalOcean allows the developer to deploy distribution of their choice. They support a wide range of distros such as Ubuntu, CentOS, Debian, Fedora, and more. Although, DigitalOcean provides you unmanaged cloud hosting, but there is a simple in-house control panel that can be organized with a 1-click installer. So for installing apps like WordPress, GitLab, Node.js, and Docker, etc. you don’t need to run command lines instead just make use of their one-click installer. There is no scarcity of options like load balancers, object storage, and block storage. Availability of plenty of data centers enables you to locate your site/app near to users geolocation so to offer the lowest latency which is one of the most significant element while operating online. Digital Ocean provides you greater opportunity to host to near a targeted location by offering 8 data centers in all major regions like the US, Europe, and Asia. Talking about support services, DO provides 24/7 free technical support through email for free which is another edge over AWS. DreamHost is a house of different types of hosting services since 1997. With such a long term experience in the market, they know how to take care of their customers. Besides hosting services, they are also ICANN accredited domain registrar with low renewals compared to the other giant services like GoDaddy. The most notable part of their shared hosting plans is that they offer the most extended 97-days money back guarantee. When it comes to cloud hosting, DreamHost does not hold as much massive infrastructure as Amazon Web Services. But DreamHost surely provides the services that best value your money. The very basic package starts from just $4.50/mo includes 80 GB SSD storage, 1 CPU core, and free bandwidth. It comes with developers friendly features and a fully supportive environment where advanced users are allowed to select from Windows or Linux or BSD operating system. Plus there are various Linux distributions which are already included or you can even upload a custom one. The major criticism on DreamHost is that they don’t have such scalable options like AWS. They only offer 3 plans with up to 8GB RAM. So if you need something more powerful you have to go for their dedicated servers. Other than this, DreamHost is a considerable option offering cloud services packed with SSDs and faster networking connectivity. The developer will appreciate their flexibility to incorporate third-party services with DreamHost. Storage applications like Retrospect, CloudBerry, and many others can be used for securing your backup files. DreamHost technical support has the edge over various other cloud providers. They serve 24/7 email support with a peak response time of 24 hours. While there is also live chat service but it is available during specific hours. All in all, Dreamhost is not a choice who are seeking a highly scalable Amazon EC2 alternative, but it’s a perfect selection for seekers who want cost-effective, reliable cloud hosting for their small to medium level apps. From 2001, A2Hosting is a steadily growing hosting company. They are popular because of their fast servers within an affordable pricing structure that makes them a good AWS competitor. They offer a variety of options on each of their hosting types like on shared you can deploy Windows or Linux. Similarly, VPS server can be launched as managed, unmanaged or with the combination of both. Even if you try their shared hosting, you will find them fairly a fastest web hosting company. On cloud hosting, they also manage to deliver the fastest services because of their SSD servers, low latency locations, and several other technologies. You will be provided with root access and numerous choices for Linux distributions. For easy features management, you can choose a distro with Webuzo during checkout process because this simple control panel provides access to the features like the one-click installer, etc. A2Hosting has its pre-made cloud packages, but if those don’t fit your needs, you can configure a plan upon your requirements. You can craft a plan with up to 32GB RAM and 12 Core CPU. Even though Amazon Web Services also permit you such feature but A2Hosting makes it simple where you just move a slider up and down. The least plan comes with a bundle of features like 20GB storage, 2TB data transfer, 512MB RAM and a choice of US, Europe, and Asian datacenter location. The company offers a unique refund policy in the web hosting industry. Unlike other providers where you can’t ask for the refund after a specific period, A2 enable you to ask for the refund anytime. Within the first 30 days there is a full refund and after that, you can still get it for un-used services (pro-rated). Support services are provided via email and live chat regardless of time. There is a phone line too but mainly for pre-sale queries. During recent years Google cloud is on rising due to its robust, cost-effective and flexible hosting solution. Powered by highly qualified experts, SSD based cloud infrastructure, excellent reputation and instant resource scaling makes it a powerful alternative to Google cloud. Although just like AWS, Google cloud is somewhat complicated while setting up an account but with a slight effort we are sure it won’t be tricky for you. Just select the cloud platform and through a simple calculator, you can calculate the cost. Not to mention, Google cloud offers the best performance cloud services. And because of their performance excellence and highest uptime, they are widely preferred by the businesses. Google is among the few companies that offer a massive number of data centers which are dispersed over the three regions such as the Americas, Europe, and Asia Pacific. Moreover, they are increasing the data center number on a continuum basis. Being one of the leading IT Company, Google knows how much security is imperative. So another advantage that you get is the state of the art security. The Google cloud platform has sturdy security protocols, and they further strengthen their system by means of eminently expert security professionals. For app developers, the instant scalability is the crucial thing so the app can manage loads of traffic. As Google featuring a giant pool of data centers, so you enjoy auto-scaling to avoid any outages. Another very worthy thing to mention is the Google Cloud billing. Because of their minute level billing, you will be charged only for the resources you use. Sadly, similar to AWS, Google does not offer free technical support too. Although during trial period you can avail free support services but after that, you have to choose between support plans such as Silver, Gold, and Platinum. You can get help anytime through their documentation for free. Founded in 2004, SiteGround is the prominent name when it comes to premium quality and fantastic support services whether it is shared, dedicated or cloud. The pooling of resources from multiple devices is best done by SiteGround which ensure zero downtime. SiteGround is the most exceptional pick for those who want to host their bigger websites on a trustable hosting without cost consideration. SiteGround offer managed cloud hosting that means you are free to focus on your site and apps development instead of getting into operating system management or other technical stuff. And the things that make SiteGround extremely easy to operate is the inclusion of cPanel. For fastest speed, they include ultra-fast SSD servers and lightweight Linux containers. Also, you can choose from their 4 data center locations (USA, Netherland, Singapore, and the UK). SiteGround put more control into your hands by allowing the launch of the custom plan that best fits your needs. You can create own plan or pick from the pre-designed ones. You can add more resources to your account, but there is also an auto-scaling feature which is great to handle traffic spikes when you are away. On SiteGround you are billed monthly or annually while each plan has monthly resource limits. The features like backup & restoration, SPAM filtering, and CDN costs nothing. The company offers resourceful plans to serve the medium to high traffic projects. For instance, the most basic “Entry” package provides 2 CPU cores, 4GB of RAM, 40GB SSD storage and 5TB monthly bandwidth. Where AWS has hasty price tags on their technical support plans, SiteGround does not charge any additional fee. Even its shared or a cloud plan SiteGround technical support is remarkably quick, friendly and take care of your problem seriously. You can submit your queries using 24/7 live chat, phone, and email. ToggleBox is another top-notch AWS alternative that offers highly scalable cloud solutions. You can avail hosting with up to 128GB RAM and 100TB bandwidth. ToggleBox ensures high-speed rendering though SSD based San storage. Opposite to Amazon Web Services, on ToggleBox your account will be ready within no time thanks to instant provisioning. With the utilization of KVM virtualization, they make cloud hosting more reliable with dedicated resources. There is no need to pick a pre-made plan as you can allocate the resources as per your specifications. Simply drag the slider and in the meantime, it will show the cost of those resources. Moreover, for installing WordPress, for instance, you don’t know the requirements there is also an auto-suggest option. The availability of Windows, FreeBSD, and Linux operating systems makes it the most diverse cloud host just like AWS. Moreover, from the tons of OS templates, you will surely find the one you want to take advantage of. ToggleBox makes it easy to make use of a cloud server. With VM cloning you can create a template of your any running server. This will assist you to quickly set up the new server by just installing that saved template. So if you have an existing site and want to migrate on AWS servers, you have to do it on your own or ask your developer to do it. On the other hand, ToggleBox provides you with a free website migration on each account. Like AWS, TogglesBox does not offer an ample number of data centers to pick from, but you can choose between Dallas and Philadelphia. Furthermore, CageFS technology and CloudLinux not only keep your account secure but efficiently allocate the resources. They also protect your money with 7 days money back guarantee. Most notably, ToggleBox provides technical support to its customers via 24/7 live chat and emails which is undoubtedly an advantage over AWS, especially for novice users. If you don’t want to get into AWS technicalities or are not experienced enough and the cost is not a consideration for you, then Cloudways brings you the unique advantage. Cloudways provides you with a solution to host your website or app on the leading platform such as Amazon, Google, and Kyup, etc. This facility makes Cloudways a best AWS alternative because you can make use of AWS robust cloud infrastructure without getting into their intricacies. Through CloudWays, you will get a simple yet easy to use control panel that includes 1-installer apps and allow you to manage other aspects of hosting conveniently. CloudWays also includes several tweaks for faster services such as built-in cache system which is a combination of Varnish, Memcache, and Nginx, etc. Plus, there is free full page cache inclusion for the apps like WordPress and Magento, etc. Furthermore, your resources are readily scalable, and storage can be extended with block storage. Another thing is data centers locations. There are almost 25+ locations in total to choose from for lowest latency. CloudWays managed cloud hosting backed with robust security practices like dedicated firewalls, security patches, free Let’s Encrypt SSL, and more. All you have to do is pick a platform like AWS and they will provide you with a free 3-days trial account. It comes handy to get a sense about how CloudWays platform works. There is no lack of developer and collaborative tools. The company has covered almost every tool such as Git integration, staging area, and team collaboration feature. Another best part is their customer support services which are available irrespective of time. You can ask for assistance via live chat, emails, and community forum. Although CloudWays is like a third party hosting provider, but their in-house active developer team adds various tools and you are provided with 24/7 available support. The best way to avail managed cloud storage via leading platforms including AWS EC2, Kyup, and Google, etc. Built-in advanced cache systems such as Memcached, Varnish, and more. Whether you are experienced or not, InterServer delivers you the greater usability with their services. The seamless account setting, flexible scalability, SSD server and intuitive control panel makes InterServer a reasonable choice to choose compared to AWS. The cloud VPS capabilities bring you a dedicated environment hence no resource sharing occurs. Instead of annual contract where you have to pay a lump sum amount, at InterServer you can sign up for monthly pricing and so cancel anytime. Like AWS EC2, InterServer allows you to pick from various Windows and Linux operating systems. It is enormously easy to add more resources as per your choice by just moving a slider. You will be handed with admin server access along with multiple developing languages such as PHP, Perl, and Python, etc. The company assures 99.9% uptime guarantee and on the failure to deliver this you will be credited with hosting credit. Although they are pretty stable and provides maximum uptime. Currently, they offer 3 locations to their cloud users. The servers in these data centers are linked together to provide the maximum service availability and protect your data from any hardware failures. The free Bread Basket is also the part of cloud VPS which is a simple feature that allows you to deploy almost hundreds of apps like Joomla, WordPress and Magento, etc. with a few mouse clicks. The $6/mo plan comes with 1GB RAM, 1 Core CPU, 25GB storage and 1TB data transfer. Also, where most of the cloud providers cost around $15/mo for cPanel, InterServer provide at a relatively low cost ($10/mo). For serving their customers regarding technical support, they offer 24/7 assistance via live chat, email, and helpdesk. So, if you are suffering difficulties with AWS with your existing project, you can try this host. AWS is a well-reputed host, undoubtedly deliver the impressive performance and dominates the market share but in the meantime, it is complex too. For a novice user, it is quite tricky that how to configure the cloud server and there are chances that they may end up with a costly resource package. Similar to AWS, Google cloud platform holds the vigorous cloud technologies and can be used as an alternative to AWS. You may found Google cloud a little bit simple to configure the resources compared to AWS but still, they are not straightforward enough to deliver a seamless cloud configuration process especially for the beginners. In our opinion, Vultr is the best AWS alternative that offers the simplified buying and configuration process. They deliver reliable performance with amazing above 99.99% uptime. They also hold the scalable solutions like Bare Metals and dedicated cloud servers. Plus, their ample global locations are also an advantage over many others. On the other hand, if you’re not experienced and still want to make use of AWS cloud services, then the CloudWays is the best way to make this happen. Through Cloudways you will get managed cloud hosting along with 24/7 live chat, email for technical support. 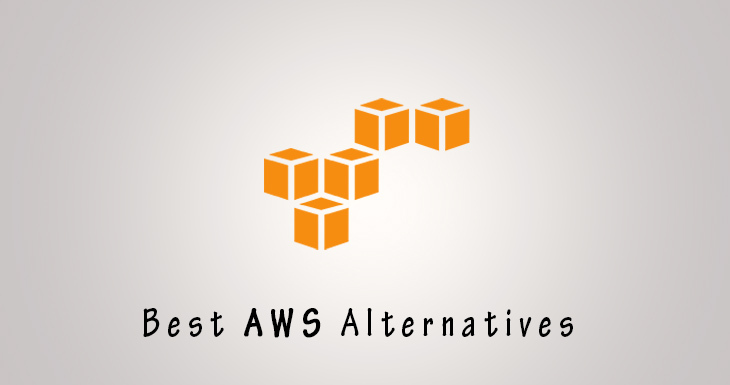 So which AWS alternative you choose for your project? Do let us know in the comments section below.